VEX Gateway is played on a 12’x12’ square field configured as seen above. 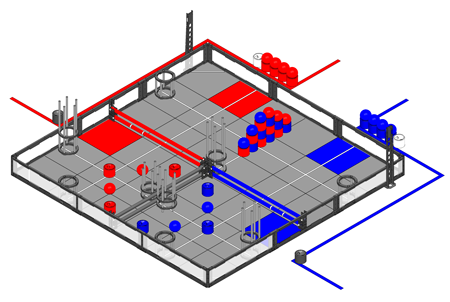 Two alliances – one “red” and one “blue” – composed of two teams each, compete in matches consisting of a twenty-second autonomous period followed by two minutes of driver-controlled play. The object of the game is to attain a higher score than your opponent Alliance by Scoring Barrels and Balls in Goals, earning Bonus Points and Doubling or Negating Goals. There are a total of twenty-six (26) Barrels, eighteen (18) Balls, two (2) Doubler Barrels and two (2) Negation Barrels available as Scoring Objects in the game. Most Scoring Objects begin in designated locations on the field, while some are available to be loaded prior or during the match. Each Robot (smaller than 18”x18”x18” to start) begins a match on one of their Alliance Starting Tiles. There are thirteen Goals, of varying heights which teams can Score Balls or Barrels in. Alliances earn Bonus Points for having the lowest Ball or Barrel in a Circular Goal. Doubler or Negation Barrels which are scored alter the point values in a Circular Goal. The field is divided into sections by two 6’ long PVC Gates that teams can lift during the Match. Excellence Award 2177 The F.I.V.E. Silver Lake Intermediate School Wisconsin, U.S. Tournament Champion 569 NHRC Murrieta Valley High School California, U.S. Excellence Award 3018 Techna Pwn Robotics Techna Pwn Robotics Iowa, U.S.